It’s about time Patrick Ewing became a head basketball coach. According to several reports, Ewing will take over the head coaching responsibilities at Georgetown University, where he played in the ’80s. The position of coach was left vacant after John Thompson III, son of Ewing’s former coach John Thompson Jr., was fired. The nepotism of the Hoyas is enough to make the Trumps blush, but I kind of love it. Look, it was time for Thompson III to go. He “spent 13 years at Georgetown and made the NCAA tournament eight times, but he missed it in three of the last four years and finished below .500 in the last two. His total record on the hill was 278-151 in in 429 games. Thompson coached some great players and some great offenses in the late 2000s, but he fell off,” SB Nation reports. Ewing has always been a tower of basketball excellence; whether starring at Georgetown 1982-1985, back when the shorts were shorter and the play was violent, or suring his NBA Hall of Fame career, 1985-2002, Ewing epitomized basketball greatness. Then he retired and became an NBA assistant in 2002, and no one came looking for his services. No one wanted Ewing to be a head coach, and the league was starting to look very suspect. In fact, in 2014 the beloved New York Knicks, the same Knicks for whom Ewing dominated inside the paint, overlooked the star center in favor of then-newly retired point guard Derek Fisher. The same Derek Fisher who would be beaten up by Matt Barnes and tossed aside by the organization some two years later. The fact that Ewing wasn’t being hired, or even seriously looked at, for a head-coaching gig became the source of many think pieces. Many believed it had to do with a big-man stigma, the idea that because a big man depends on his size to play the game, he doesn’t understand the game as well as, say, a point guard. There was the obvious feeling that Ewing was being looked over because of his race, and surely there is some truth to that, but we will never know how much. And now, some 14 years into his coaching career, Ewing will finally get a chance to have a team that is under his full control. The hiring of Ewing still feels directly related to Big John, and I love that, too. Coaching choices always feel incestuous. Most teams hire either from within the organization or alma maters of a university. In fact, the Fisher hire was all about Phil Jackson, the head of the Knicks basketball operations, believing that Fisher could implement his offense based on his years of playing point guard in the NBA. Didn’t matter that Fisher had absolutely no experience as a head coach. Imagine how painful that must have been for Ewing to know that he’d done everything the right way—learning since 2002 as an assistant coach—and no one was interested in his services. 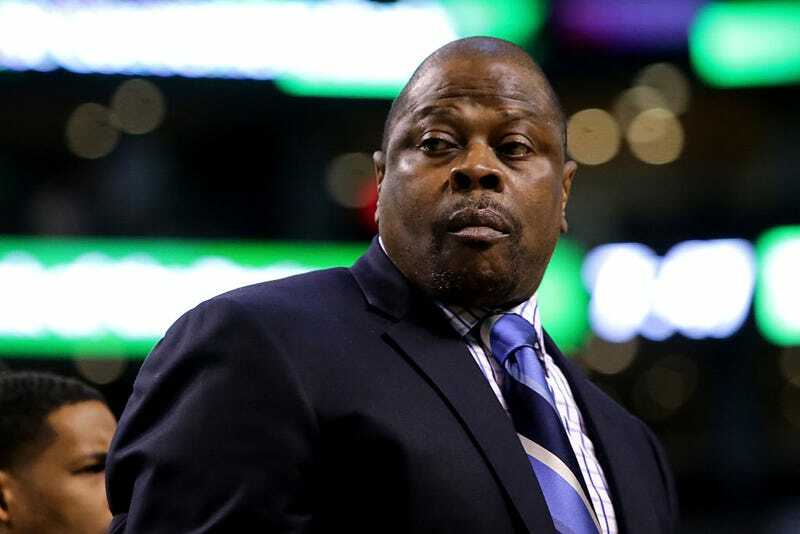 It had to be disheartening, but no matter how Ewing got the job, I truly hope two things: First, that he wins. I hated Thompson III’s Princeton offense and series of ridiculously boring back cuts, and Ewing winning will help all of that go away. I also hope that he can use the Hoyas to get to an NBA coaching job, because that’s the job he really wants, and no one deserves it more than he does.